The KEDRAB Formulary Monograph provides detailed information about the rabies virus (RABV) and how it damages the nervous system, vectors for infection, current PEP guidelines, a complete description of the efficacy and safety of KEDRAB™ (Rabies Immune Globulin [Human]), and how KEDRAB should be used in PEP for rabies. 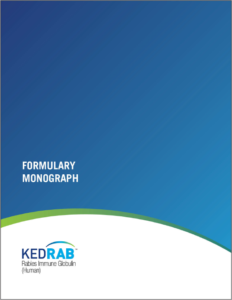 Request your copy of this comprehensive Formulary Monograph by completing the form. Ask to receive a call from a Kedrion Biopharma representative for more information about KEDRAB and details on how to pre-order. References: 1. Data on file. Kamada Ltd. 2. Scott TP, Nel LH. Subversion of the immune response by rabies virus. Viruses. 2016;8(8):231. 3. World Health Organization. Media centre rabies fact sheet. http://www.who.int/mediacentre/factsheets/fs099/en/. Updated March 2017. Accessed July 6, 2017. 4. Ghosh JB, Roy M, Lahiri K, Bala AK, Roy M. Acute flaccid paralysis due to rabies. J Pediatr Neurosci. 2009;4(1):33-35. 5. Rupprecht C, Kuzmin I, Meslin F. Lyssaviruses and rabies: current conundrums, concerns, contradictions and controversies. F1000Research. 2017;6(F1000 Faculty Rev):184. doi:10.12688/f1000research.10416.1. 6. Centers for Disease Control and Prevention. Learning about bats and rabies. https://www.cdc.gov/rabies/bats/education/. Updated April 22, 2011. Accessed June 9, 2017. 7. Centers for Disease Control and Prevention. Use of a reduced (4-dose) vaccine schedule for postexposure prophylaxis to prevent human rabies: recommendations of the Advisory Committee on Immunization Practices. MMWR Morb Mortal Wkly Rep. 2010;59(2):1-9. 8. Centers for Disease Control and Prevention. The burden of rabies. https://www.cdc.gov/Features/dsRabies/index.html. Updated September 26, 2016. Accessed June 30, 2017. 9. KEDRAB [package insert]. Fort Lee, NJ: Kedrion Biopharma Inc.; 2017.